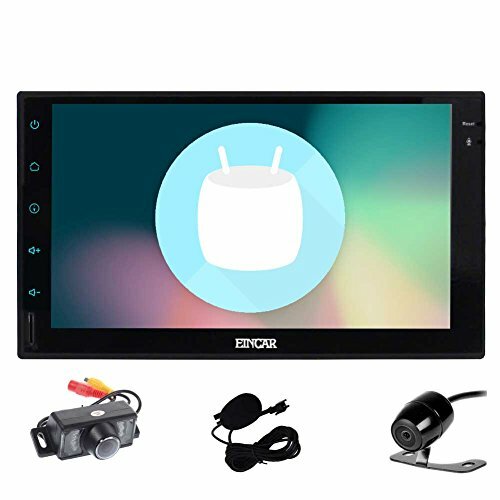 - New car stereo with customized Android 6.0 Marshamallow, Quad core CPU with 1GB RAM and 16GB ROM, leading to higher processing speed and better using experience. - Unique black body case, more stability, better anti-shock and high-grade appearance. - Support Dual Camera Input (Front & Back Camera), safer for your driving. - Come with a FREE External Microphone. - Simple & faster User Interface, GPS, Radio and multimedia features at a glance, simplified interface can reduce the number of operations, optimize the speed of the system. OS: Latest Android 6.0 Marshmallow system,Quad Core Processor,16GB ROM,1GB DDR3;7 Inch widescreen with Capacitive Multi-Touch Screen,800x480 Resolution; Built-in Microphone and ★ External Microphone is included!